So much is hearsay right now about the Common Core, it feels like the educational system has become a tabloid in their interpretation of what does not even exist yet. In fact, from this level of speculation has sprouted a whole cottage industry of guessers. If there was a psychic on Sunset Blvd. giving Common Core readings for $9.95, I wouldn’t be surprised. What will be the name of the new baby? Where is the hip spot to get the latest dish? The problem, however, is that those who are creating the assessments are moving at a pace as if the only deadline they need to be concerned with is the one dictated by the actual testing date of 2014-2015. However, if schools are to prepare the kids for those tests, we need to plan and prep now. (It’s the ole tail wagging the dog all over again). We need facts, not gossip. But what’s out there is merely hypotheses, and the ability to get as close to the inner circle of those in the know has become a growing industry of prediction, not knowledge. And these predictions will be marketing those guesses to the vulnerable teachers concerned about student achievement and learning. But there is a movement afoot of teachers taking control of their curriculum in this age of uncertainty. ?For without a clear path, sometimes opportunity blooms, creating one’s own path. ?And many districts and teachers are doing just that. CAT is about differentiating assessments and also using assessments formatively. I figure as long as I’m doing both of those things, I’m ahead of the game. One of the ways I differentiate my assessments is by teaching students about Costas Levels of Questioning and then having them design Levels 1, 2, and 3 questions and use these questions as the basis of my own informal assessments. I also teach them about closed-choice questions, rank order questions, and open-ended questions. ? In addition, I use student choice whenever possible so that a student has the opportunity to show me what he or she knows in the method in which that student is most comfortable. ?After all, if the goal is to see how well and deeply they learned, why not give them the chance to show off their knowledge in the best way possible? 2. To address the writing component and the performance-based assessments, I have become deeply dedicated to project based learning this year. I’ve been writing about it throughout this past school year, but my use of collaboration, technology, inquiry-based instruction, and project-based writing has increased significantly. What was once something I only took time to do during 4th quarter when the assessment pressure had subsided, has become something I do despite assessment pressure. And I’ve been rewarded greatly in student enthusiasm and even test scores. See my Edutopia post here. My doodle I thought of this morning in the shower. 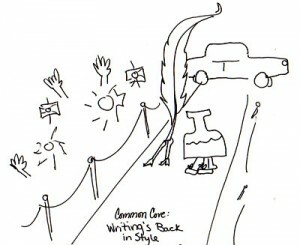 We know that writing is back in style due to the Common Core. In fact, and frighteningly to some, it wil be back in style across the disciplines. And from what I understand, Math students will be asked to write about why they selected a particular equation or how they came to a particular conclusion. It’s all about informational and persuasive writing, and all classes will have to use writing in both assignments and assessments in order to comply. Frankly, that doesn’t sound unreasonable to me because writing in unavoidable in “real life.” No college bound kid or career bound kid (white-collar or blue or grey or chartreuse) can avoid it. I want to end by saying that I’m not against having standards. I’m also liking a lot of what I’m seeing in what’s out there about the Common Core. Really I do. It’s this blindly searching in the dark for what’s going to prepare these kids that I resent. It’s the private industries making money off of our fears and lack of knowledge of what’s to come when in fact many of them don’t know themselves. The districts and schools have been left to fend for themselves, designing lessons and assessments that they THINK will address this new chapter of standardization. I’m just waiting a bit for the other shoe to drop. Teachers and administrators are on the same page here, designing and developing and evolving their curriculums based on rumor, but I don’t doubt that their stuff is good. Really good. Better than most privatized companies could design because these lessons are created with deep learning at heart. I only hope that what turns out to be fact doesn’t squeeze out the efforts and creations of all those proactive educators. Nevertheless, sometimes where there’s smoke, there’s fire. And if the rumors are true, this country will have their students prepared by the amazing troops of educators who didn’t wait around for answers, but instead ran out on the field to meet their fight headlong with pens, laptops, Interactive boards, podiums, iPads, and even #2 pencils a-blazing.